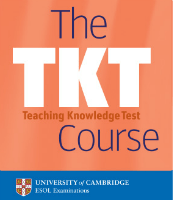 Are you ready for the TKT exam? A pre-service or a practising teacher. Teaching primary, secondary or adult learners. A non-first language or first language English speaker. A teacher wanting to gain formal recognition of their experience. A teacher wanting to keep their teaching skills up to date. A teacher looking to develop their career opportunities. If any of the above apply to you, you may want to speak with one of Live Lingua's TKT tutors. The first trial TKT class is absolutely free. You can speak with the tutor to see if they think you are ready for the TKT test and they can propose a study plan for you. No credit card required, and no commitment. TKT is a flexible series of paper-based modular teaching qualifications, which test your knowledge in specific areas of English language teaching. You can take as many modules as you want, over any time period. You receive a Cambridge English certificate for each module you complete. The TKT tests follow a multiple-choice format. After taking TKT, you can take other Cambridge English teaching qualifications such as ICELT and Delta. Do you have any questions about the TKT test? You can speak to one of our TKT tutors for free to ask any question you may have. They will speak with you and evaluate how prepared you are. Each module has one test paper, which lasts 80 minutes and has 80 questions. Each question is worth 1 mark. There are multiple-choice and matching questions. Speak To A TKT Tutor Today! What makes Live Lingua TKT tutoring different from the local tutors or enrolling at a local language school? And best of all, we let you meet and speak to your future TKT teacher before having to commit to paid classes! The more TKT lessons you enroll in at the same time, the cheaper the hour of class gets. Still not sure if Live Lingua TKT tutoring is the right choice for you? Then just try a free lesson with one of our tutors to make sure. No risk, no commitment. I am got moved to the New York from our Japan offices, and have been with [my English teacher] for almost 2 years now. My co-workers are surprised at my constant improvement. Skype English lessons were exactly what I was looking for to learn English. My teacher worked around my busy work schedule, and my co-workers are amazed at my progress. [My English tutors] at Live Lingua have been great. I have been taking 2 classes a week, and then I change tutors every 2 months, and every tutor I have had so far has been great. I will be continuing with Live Lingua for a long time, and may even sign up to take other languages with them.